This month we have two winners for Best Picture of May. 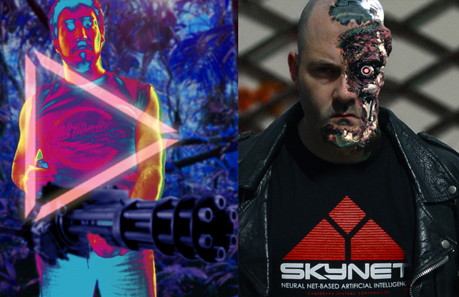 Julien Mazzoni submitted this superb Predator inspired image (above left) and wins 3 Last Exit to Nowhere T-shirts. Sean Steele is also our Best Picture of May competition winner with this great The Terminator homage image (above right). A nifty bit of photoshop work going on there, great stuff. Sean wins 3 Last Exit to Nowhere T-shirts this month. If you’d like to enter our Best Picture of June competition then get your thinking caps on and have a go. Thanks to everyone that submitted their photos and image this month, some of the ones that didn’t quite win the competition you’ll find in our Gallery section.